We've Installed Thousands of Walk-In Bathtubs in Louisville! "Our service is your solution"
For almost a decade, Walk-In Tubs of Louisville has been a symbol of superior quality, first-class customer service, and detailed development of safe, and luxurious walk-in bathtubs and showers. From the day we opened our doors for business, attention to detail has always been our top of mind priority. We never cut corners and strive to always over-deliver with our results, especially when our products improve the overall quality of life! Within your every day routine, you shouldn't​ ever have to make the decision between safety, comfort, and independence. By combining comfort and luxury with today's latest technology, Walk-In Tubs of Louisville has perfected the process of installing the safest and most enjoyable walk-in bathtubs. Giving you the peace of mind when you are able to bathe like royalty, taking away any of your previous risks. Why Buy A Walk-In Tub Or Shower? Anyone with mobility issues knows the dangers of bathing alone, risking a fall just isn't worth it. 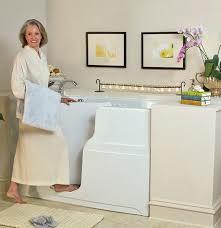 Walk-in bathtubs are designed to eliminate all possibility of slipping with handrails, seats, and textured pads to aid the user in comfortably keeping their head above water. When an accident in the bathroom happens, everyone close to that person is affected. The easiest, safest and most convenient way to keep everyone at ease is by installing a walk-in tub. The user ratings can't be argued with! The industry leading line of walk-in tubs that we carry, eliminate the need to step over the front of the tub, which allows a safe and effortless entry or exit. With this, you will regain the feeling of complete independence and relaxation during the time it's most needed. All Of Our Work Is Guaranteed!.. With our proprietary installation process, Walk-In Tubs and showers are easily installed in one to two days. Plus our work is 100% guaranteed and backed by our industry leading Lifetime Guarantee. We take care of everything and when we're finished you have a luxurious new tub! I love my tub! Its been at least 5 years and we are still pleased. I had an issue with a part and they took care of it immediately. I would highly recommend one to anybody! Getting Your Own Walk-In Tub Is Easier Than You Think! 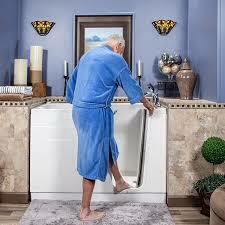 Install & Demonstrate Your New Tub! Most installations take only a single day! First we carefully remove your existing tub, then we diligently install your new walk-in tub without any damage to your walls, floors or fixtures.The end result is a luxurious new tub that not only provides an improved bathing experience, but also provides an upgrades the bathroom design!